Myles Jury, the veteran of the 15th installment of The Ultimate Fighter who arrives at UFC 171 this weekend with a perfect 13-0 record, has literary tastes that steer him toward shelves stocked with self-help and business books. In training camp, he has a lot of downtime to read, so Fightland caught the UFC lightweight on a Friday afternoon and talked about the lure of Tony Robbins, his financial targets, and why flying under the radar isn’t the same as ingesting a magic pill. Fightland: I know that you have a big affinity for reading books in the self-help/business/motivational/self-empowerment genre. What’s at the heart of the interest in those types of books and those types of authors? Myles Jury: I’m always trying to evolve and I’m always trying to learn new things. The mind is the most powerful weapon you have. I read everything from self-improvement books to business books, investing—whatever topics interest me, I research ‘em and I learn about ‘em. If a book is a tool to answer a question that you have, what are the books that have been of biggest benefit to you, that you still remember long after reading them? For self-improvement, I’d say Tony Robbins’s Awakening the Giant Within. And for investing, I’d recommend Rich Dad, Poor Dad, as a beginner’s book. I’ve read a bunch of books that span off those topics, about different types of real estate investment, but those are two of the books that really opened up my eyes. So your opponent this weekend, Diego Sanchez, it’s no secret that he’s big into Tony Robbins as well. 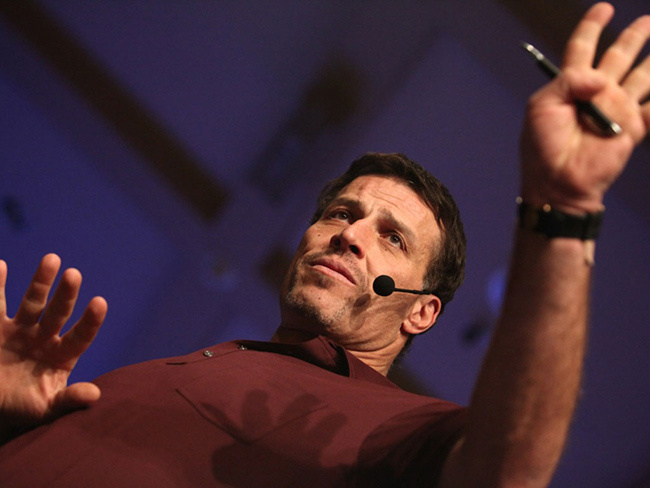 I don’t know that much about him—I know his very distinctive voice, but what’s the appeal of Tony Robbins? I feel like a lot of the stuff he talks about, I can relate to. He brings up a lot of real-life situations that a lot of people go through. You can either deal with them and learn, or a lot of people just bury their head in the sand and say, “I don’t need any help.” I feel like he’s got a lot of different tools for a lot of different subjects that are pretty simple. You don’t have to be a rocket scientist to read his books. Is there any one piece of wisdom that has really altered your view of something, your perception of a problem that you face? One of the things I really took away from the Tony Robbins book was an acronym, CANI, and it stands for Constant And Never-ending Improvement. One of the things he talks about is that he’s always interested in learning. And that’s a powerful tool. If you’re always interested in learning your whole life and you’re always evolving and changing, it keeps life fun. Stuff doesn’t get stale. Stuff doesn’t get too old. Why have you been reading up on personal finance and business and investing? I know what it’s like being a fighter that’s coming up, sleeping on couches, stretching $20 for the whole week, not knowing when you’re gonna get paid, trying to get your fight winnings to take you through to the next fight. So I know what it’s like to not have any consistency or any guarantees in life, like most people who have a 9 to 5 with a guaranteed paycheck. When I was younger, going through a lot of tribulations, couch-crashing and being broke and just putting my time in the gym, pretty much training for 10 years without getting paid for it, I knew when I did make it to the UFC and started making some money that I wanted to be prepared. I’ve learned everything from budgeting to different investment vehicles, some of the stuff you wanna stay away from when you start making money, some of the positive things you might do. I read books on people who are wealthy. Not just rich—I mean people who can make money, keep the money, and then make even more money. I look at my life, and I don’t want to be someone that makes a bunch of money and then goes broke in a couple years if I stop fighting. I don’t want to be that person. Who are a handful of those role models in business and finance? Robert Kiyosaki is really easy to understand and for whatever reason I really relate to what he says. He speaks a lot through storytelling. He’s not too technical—personally, I learn more through stories and examples. And Think and Grow Rich by Napoleon Hill was a great book that I feel could change a lot of people’s lives. But the one where I built a good start in my financial literacy was Robert Kiyosaki. You mentioned the volatility in fighting. That’s true in both in a physical sense and in terms of the uncertainty of the pay structure. In taking a long view, what do your long-term financial goals look like? Are you just looking for a well-funded 401k, or are you trying to buy up islands? Someday I’d like to have my net worth somewhere from $100,000 to a million dollars. But honestly, I’m a cash flow guy. I don’t like parking my money or saving my money and stuff like that. I like putting my money in different vehicles that are going to continue to produce more money. It’s hard for me to set a budget right now because I want to have a kid one day and have a family, and I don’t really know how much that’s gonna cost. But I just want enough money coming in so that I can live comfortably and never have to worry about bills. Do you have any businesses of your own? Or any irons in the fire in terms of investing? I don’t really want to get too personal and say what I’m invested in and stuff like that, but yes, I do. From a business standpoint, the closest thing that I have is Jury Jiu Jitsu; something I know I’m gonna do when I’m done fighting is teaching. I’m trying to get that business structure set up so I’ll be able to travel around the world and teach, and at the same time, make money and keep a roof over my head. And like I said, I’ve got a couple other things I’m working on that are gonna be good investments. So you’ve managed to stay undefeated in MMA. Are there any lessons you’ve picked up from what you’ve read that you might attribute to being part of that degree of success? I’m reading a book right now called Good to Great, and it talks about how some of the best companies managed to stay great longer compared to companies that were just good. It wasn’t a magic pill: It was consistency, discipline, and dedication. And from the outside looking in, people would say, “Wow, where’d they come from? They just popped up out of nowhere.” But they didn’t. They were working for years and years, but nobody noticed them until they started breaking records and having high stock prices and stuff like that. I thought about that in terms of my career and it’s kind of the same thing as a fighter: You put in all this time over all these years, and eventually you win a big fight and everybody’s like, “Wow, who’s this kid who came out of nowhere? What’s the magic pill he’s taking?” But when you look at how that guy came up, he’s been putting his time in.